The implementation plan was developed by the Implementation Planning Committee, consisting of 17 organizations and community based agencies. The plan aims to bring the community significantly closer to preventing suicide in Edmonton which will position Edmonton as a leader in suicide prevention. Living Hope was approved by City Council on March 20, 2018. Following a brief period of transition, the Community-Based Implementation Team will be formed to guide this work going forward. 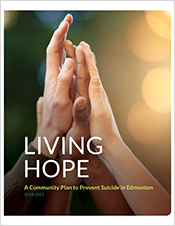 The Edmonton Suicide Prevention Strategy was developed through a collaborative process that specifically considered the Edmonton context through local research and data. The vision of this 5 year strategy is to create a suicide free Edmonton and all Edmontonians have a role to play: in educating, increasing hope and promoting healing in order to prevent suicide in Edmonton. The Strategy promotes a universally preventative approach that depends not only on the health care system but engages the whole community in preventing suicide. In the fall of 2014, City Council discussed adding barriers to the High Level Bridge as a suicide prevention initiative. Council also recognized the need for coordinated suicide prevention approaches. Formed in 2015, the Edmonton Suicide Prevention Advisory Committee (ESPAC) worked collaboratively on the development of a suicide prevention strategy that includes recommendations. The work of ESPAC was incorporated with City Council’s Urban Isolation & Mental Health Initiative. The Edmonton Suicide Prevention Strategy was approved by City Council in September of 2016. The City was directed to implement a plan, making the strategy a reality.